Addison Oaks County Park is a beautiful 1,140 acre matrix of wildlife. It’s a landscape rich with woodlands, wetlands, meadows and miles and miles of trails, many of them equestrian friendly. Last weekend Addison Oaks hosted the second annual Equestrian Camp Out in partnership with the Addison Oaks Trail Riders: equestrians committed to the maintenance and expansion of bridle trails in and around Addison Oaks County Park. 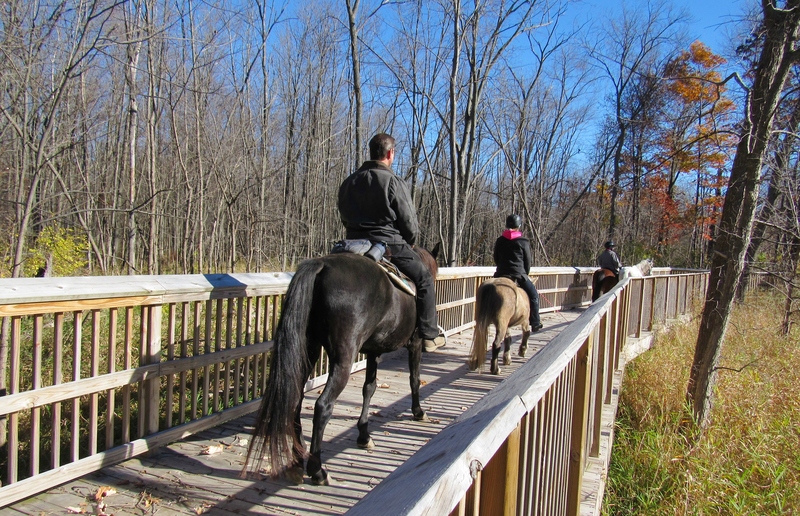 Almost 7,000 acres of parklands are managed by Oakland County Parks with horse-friendly trails at Addison Oaks County Park, Addison Oaks-East, Highland Oaks County Park and Rose Oaks County Park. The trails of Rose Oaks take riders deep into woodlands and over new boardwalks giving riders dramatic views of glacially sculpted landscapes, old farm fields and mature evergreen and hardwood forests. Nearly 100 equestrians participated at last weekend’s event. Most of the riders were from Oakland County, but others came from as far away as Bowling Green, Ohio and Glennie, Michigan to participate and were rewarded with spectacular woodland and meadow trails. 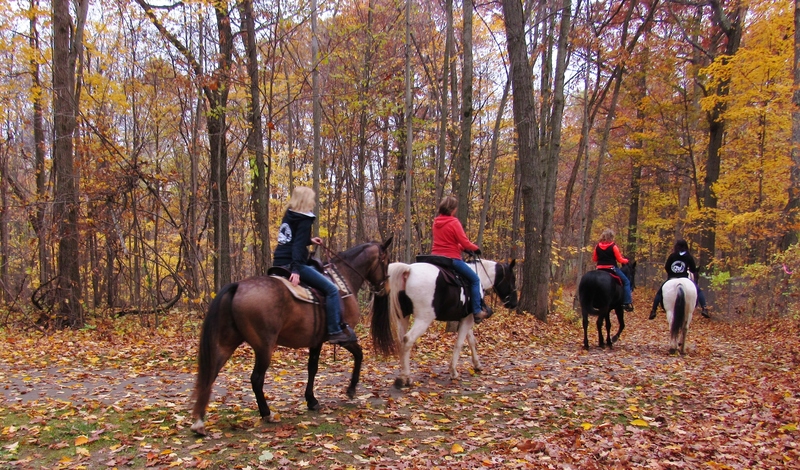 Oakland County Parks is rapidly being recognized as a leader in trail connectivity with the understanding that by being receptive to user groups such as equestrians, other park visitors also benefit. 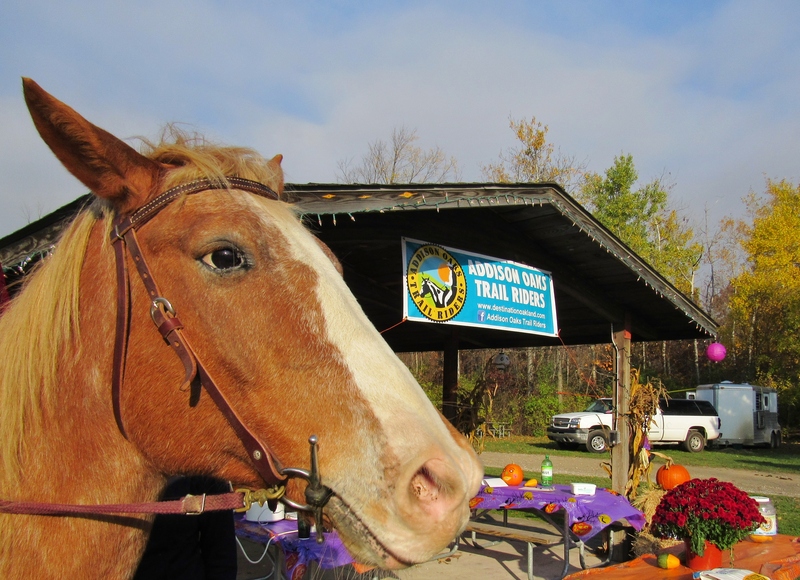 Local equestrian groups, including the Addison Oaks Trail Riders, have partnered with Oakland County Parks to improve the recognition of horses as being an integral part of rural Oakland County. Highlights of the equestrian camping and trail-riding event included hours and hours of riding through Addison Oaks, a night nature hike, and a pot luck campfire dinner under a star-studded sky. Campers were rewarded with the songs of sandhill cranes at sunrise, coyotes yipping at night, and for a lucky few, the flight of a bald eagle over the meadows. We’d be remiss if we didn’t mention the sparkling waters of Buhl Lake, the gem of Addison Oaks. Participants renewed friendship, developed a deeper appreciation for park operations and perhaps went home with a new understanding of the timeless words of John Muir, “In every walk with nature one receives far more than he seeks.” It’s more likely than not that Muir’s words take on a new meaning when exploring on horseback. If you missed this event or aren’t aware of the numerous four-season outdoor recreation opportunities available at the 13 Oakland County Parks, then perhaps it’s time to connect via Social Media. In addition to following this weekly blog on the Oakland County Website, look for Oakland County Parks and Recreation on Facebook. Don’t forget, you can also join the conversation on Twitter @DestinationOak, on Instagram @oaklandcountyparks and on Pinterest at Oakland County Parks. The Addison Oaks Trail Riders can also be found on Facebook. Visit DestinationOakland for details on all 13 Oakland County Parks. As the days shorten and the nights cool, the woodlands of Oakland County are transforming into kaleidoscopes of color. Golden hues of sugar maple, the deep crimsons of sassafras and the scarlet-red shades of red maple are the dominant colors on nature’s autumn palette. 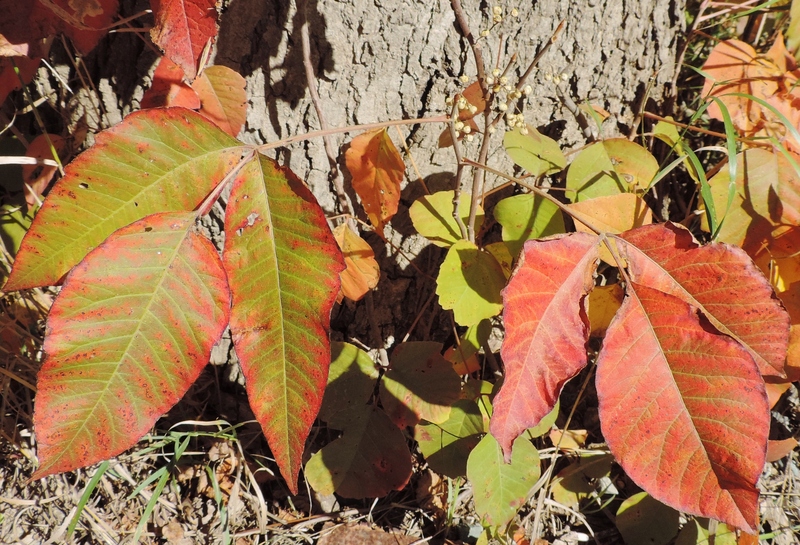 However, there is one troublesome plant that hides in the showy mix, a plant dressed in alluring shades of red: Poison Ivy.